‘Good teaching and learning’ - that has been the Science department’s focus in the last 10 years. We have achieved this – reflected in our consistently high attainment in Double and Separate Award Science. We are continuing to attain our goal of ‘outstanding teaching and learning’. 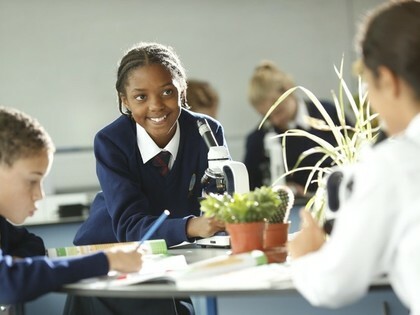 We are the largest department in the School as Science is a CORE subject (with effectively 3 subjects combined – Biology, Chemistry and Physics). We have a Head of Department (overall responsibility) and now have heads of Biology, Chemistry and Physics. We have six experienced teachers (5 full time, 1 part time). We all have vast experience (and success) at delivering the GCSE Curriculum with three Biologists, two Chemists and one Physics specialist. Our Sixth Form block has 3 laboratories, dedicated to AS/A2 Level teaching of Chemistry and Physics. Pupils Study the ‘Exploring Science’ Framework - at KS3 (Years 7-9). This utilises Exploring Science although we have made our own Scheme Of Work, adapting to our students and duration of teaching hours/week. We will have a 2 and half year KS4, starting halfway into Year 9. We study ‘How Science Works’ GCSE at KS4. In Years 7 - 9 we use ‘How Science Works’ schemes which are with resources from ‘Exploring Science’ - Pearson and Longman. This links with a comprehensive interactive ICT programme. Years 7 - 9 have mixed ability classes. At KS3 students receive five science lessons over the two week timetable. We have end of unit tests every 3-4 weeks, which we use to track progress and intervene when needed. With Separate Science we use the AQA Science – Longman. This course is taken in Year 10 as an ‘option’. These are 5 extra lessons, over a two week period, again culminating in 6 Examinations, leading to 3 separate Science GCSEs – Biology, Chemistry and Physics (No Coursework). In Year 10 we have 9 lessons per 2 weeks ( x3 Biology x3 Chemistry and x3 Physics with separate teachers, according to their specialism). In Year 11 we have 9 lessons per week ( x3 Biology x3 Chemistry and x3 Physics with separate teachers, according to their specialism). In addition to testing every 4 – 5 weeks, we have Mock examinations in December and Examinations in May/June. Thus, tracking of progress can be made with an accurate prediction of the GCSE (facilitating intervention). All topics have required practicals and end of unit tests. Students study one topic of either Biology. Chemistry or Physics each half term alongside students who have chosen that option. During Year 11 students will study each aspect in greater detail. To study A level Biology is to embark on a journey of discovery!! Students learn about the basics of life, of organs and organ systems that can determine health, or sickness and disease. Best of all, students look deeper into the nucleus of cells and discover the amazing molecule called DNA. It controls almost everything that makes you, you. Students will study the principles of electron microscopy, ultrastructure of cells, biological molecules, enzyme technology, transport and exchange mechanisms in plants and animals, classification, diversity and speciation. In the second year, biotechnology and genetic engineering are key features, and the range and limits of homeostatic control systems, nervous and hormonal coordination. Many physiological and biochemical processes including respiration and photosynthesis are also explored. Practical work is at the heart of biology and will be examined in the written exams. Field work is a compulsory element of the course, usually undertaken at Juniper Hall in Dorking. AS: two written examinations each 1 hour and 30 minutes long. This is now a stand-alone qualification and will not contribute to A-level. A-Level: three written examinations each 2 hours long, at end of two years. There are 9 lessons over the two week timetable taught by 2 Biology specialist teachers. Chemistry is about everything. It is the central science that explains how the world around us works. It enables us to see patterns in the myriads of chemical reactions that occur in nature. In this course students will see how the laws of chemistry and the skills of today’s chemists have been used to achieve our present high standards of living. AS Chemistry is an exciting course that places emphasis on the application of knowledge and the usefulness of laboratory research. Progress will be checked via Independent Study packs and end of unit tests. Students will study the basic laws and principles of chemistry and learn how to predict the properties and the atomic structure of elements from their positions in the periodic table. Topics will also include organic chemistry, carbon compounds including fossil fuels, plastics and recycling. Students learn how to control chemical reactions and the importance of chemistry in manufacturing processes. Students are introduced to modern analytical techniques such as mass spectroscopy and nuclear magnetic resonance. There are 9 lessons over the two week timetable taught by 2 Chemistry specialist teachers. Students’ practical skills will be developed throughout the course and assessed in the written examinations. Physics is about how things work, from the nano-scale to the cosmic - super massive black holes and galaxies within the universe. Students will learn about forces in mechanics, waves, electrons and protons, gravitational, electrical and magnetic fields. Students will investigate nuclear energy and apply the fundamental principles learnt to solve real problems. Practical investigations will be conducted in the Physics laboratory in addition to learning theoretical Physics. Progress is checked via homework and testing, each week. We have a KS3 Year 7 Science Club. This term the students have been designing and making models of Formula One cars. Biology: The possibilities range from medicine to agriculture, forensics to zoology. Almost any degree will accept A-level biology. Chemistry: All manufacturing industries, pharmaceuticals, food processing, cosmetics and metal works. Chemistry is essential for medicine, dentistry, chemical engineering and a whole host of health and environmental courses. Physics: Essential for any engineering course or degree and is highly sought after for other scientific or technical careers. Physics is an advantageous subject for courses ranging from medicine to careers involving business and finance. Text books - ‘How Science Works’ schemes which are with resources from ‘Exploring Science’ - Pearson and Longman. We issue ALL students with a ‘MyGCSE’ Login that is useful as an ‘online teacher’ with video-clips for most topics. We encourage ALL students to purchase Revision Guides, linked to the AQA course, with accompanying Workbooks.